The often talked about, Melbourne Metro underground extension is one of those top end pipe dream infrastructure projects that should help transport Melbourne into the future. With big ticket items comes big planning and infrastructure expenditure. The project is it proceeds will involve an estimated one year disruption to Swanston Street trashing the $25.6 Million that the City of Melbourne has spent over the last year not to mention the money spent on upgrading the Domain interchange. Missing from the bigger picture is how the long talked about Eastern Freeway corridor rail line will interface into the new network if at all. 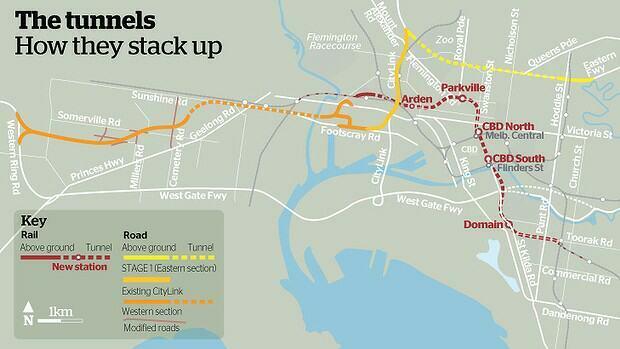 And which route the long waited Airport rail link will take. This tunnel could be a busy rail hub after all. 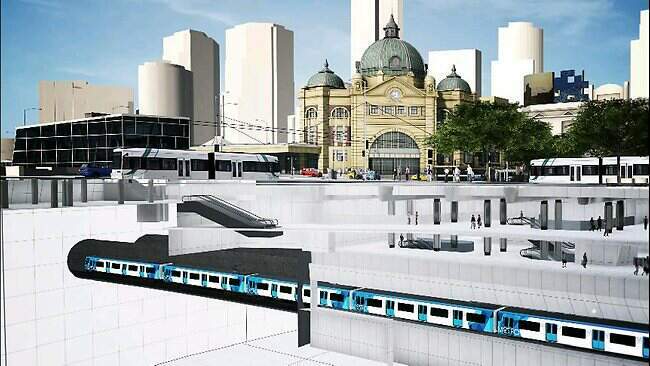 We just hope they have got the planning it right this time unlike the lack of long term planning when they built the Melbourne underground rail loop . The other issue effecting our rail network is the removal of level crossings. Crossings that limit the number and frequency of trains in Melbourne. The impact that level crossing have to the overall performance and functioning of Melbourne transport system can not be overstated. These projects also should be on the drawing board and private investment funding sought. There is an opportunity here to integrated commercial shopping centres into new underground passage and freeing up of land utilization. Visionaries, like Darebin’s Mayor Tim Lawrence, are keen for State Government to invest in outer Melbourne’s future by supporting redevelopment along the Bell Street corridors. If this was attended to then a large tracks of road and rail development and commercial infrastructure could be freed up to help stem the pressure on Melbourne’s ever expanding urban sprawl and road network congestion. Similar opportunities exist on the Dandenong-Frankston lines. Removing level crossings on major roads should be given equal if not higher priority. Local Councils should be allowed to independently pursue redevelopment finance proposals to remove level crossings capitalizing on the land, rail and commercial development integration to the benefit of their local communities. The Napthine State Liberal Government has slugged Melbourne with a 33% increase in the “Congestion Tax” up from $900 to $1200 per car space. The extra imposition of a parking tax will hit small businesses the most. As the cost of travelling and shopping in the City centre increases more and more customers will opt to shop and do business at the suburban shopping centres were carparking is free. This creates a never ending spiral. the greater the impost on business and retail , fewer customers increased costs, less trade, fewer businesses. The City Council continues to engineer congestion. The reduction in traffic lanes in LaTobe street and the proposed reduction of lanes on Princes Bridge will add further to inner city congestion. Last time the City Council had a windfall in the congestion tax the Council spent the money on the Orange Tourist buses and creating bike lanes. It should have spent the money generated on establishing a mini bus route that links Melbourne’s inner suburbs. Why do we need to have large buses in the inner city area? Better still rather than handing money over to the City Council to waste, The State Government should provide free public transport within the City (Between Docklands/North Melbourne to East Melbourne, Domain Interchange/South Yarra to Parkville/Melbourne University and the Zoo) Free inner city public transport would go a long way towards invigorating Melbourne and providing residents and visitors alike a real benefit whilst easing traffic congestion.. The Brumby government’s idealistic road traffic plan has already failed, evebn before it has been launched. The proposals publish in the the Age last month failed to address any concerns or needs for motorcyclists/scooter riders. Motor Scooters in particular play a major role in the urban transport system and the government needs to do much more to assist in their safe usage of the road infrastructure. Small motorcyclists should be able to share the the bus/bicycle lanes where appropriate. Where is the MRA on this issue? Where is the city Council’s policy development? And why had the news papers not taken up this issue? Unless the government can take into consideration all modes of transport the new road use will only be half baked notion, whilst giving an impression of doing something isbeing doomed to fail. John So and his spend drift team are planing on pumping yet again more money into the dubious Melbourne Tourist Bus promotion scheme whilst ignoring inner city transport needs. Flush with cash for the long term “we hate cars” parking tax the City of Melbourne has resolved to spend millions more on expanding the free tourist bus. The Tourist bus does not serve Melbourne’s residents and business community and certainly is not benefiting or reducing traffic congestion. The City of Melbourne has already put a private tour company out of business by providing a free bus tourist service. The free bus also undermines Melbourne free tourist tram. Why not sure who is benefiting from this Tour Bus deal but pouring more and more money into the ill considered venture is not the way forward. The money could have been spent in setting up a private drive-owner mini bus taxi service that links Melbourne inner-city suburbs of East Melbourne, Carlton, Parkville and North Melbourne. Mini buses are the way to go. The bus would ply a fixed rout and would be able to be flagged down and stop on rout in the same way as you would flag down a taxi. Each bus would be operated by the driver-owner and council would in the first instant subsidise the setting up of a trail service. The idea of mini=buses has not taken off in Melbourne for some reason as the main public transport operators prefer to run large buses. Problem is with large buses is that they require large bus stops and the frequency of service is far and far between. Mini Busses could run every 15 minutes of so depending on the route or demand. They would not require large bus stops and can travel routes that large buses could not travel. John So should stop wasting limited Council resources and pumping more money into a failed service. John So continues to demonstrate that he does not have the answers or right policies to see Melbourne develop into the future. Meanwhile the Greens continue to sit back and remain silent grateful that the City of Melbourne is prepared to pick up the tab for Eco-non-friendly world tours. Melbourne City Council continues to come under attack as Melbourne’s business community begin to loose confidence in the Lord Mayor and the administration of the City Council. John So extraordinary long honeymoon has come to an end as he faces the reality of running a city. More and more City business leaders are beginning to question the Lord Mayor’s policy and directions. John So’s hypocritical and ill considered ‘war on cars‘ is seriously undermining public confidence in his ability to manage Melbourne’s future development amidst concern that the City Council unjust tax on inner-city car-parks and increases in the cost of on-street car-parking is beginning to bite as city consumers begin to give the city the miss. The selective taxation on Melbourne businesses and city commuters and associated increased cost to the consumers seriously undermine the viability of Melbourne’s retail sector with suburban shopping complexes being the main beneficiary. The Herald-Sun reports that business are already planning to shut up and move shop to another location. John So is quick to reclaim the title of Lord Clown as the City Council is fast becoming beyond a joke. Lord Clown and his Deputy hold on to their cars as the Council refuse to disclose cost to ratepayers – Claims of hypocrisy as the Lord Mayor advocates other to abandon their cars. Although Melbourne is still yet to finalise its transport policy the City Council has already allocated the spoils of the new tax which is a bit like pulling the horse before the car. The car-parking tax, supposedly designed to ween Melbourne off cars and help ease inner City congestion is being used to establish a free tourist bus in direct competition to the free tourist-tram and existing ‘private’ service providers. The Tourist bus along with other proposed transport solutions are ill-considered. As the Herald-Sun editorial correctly points out Melbourne needs to first improve its public transport before providing a free ride for 1/2 day tourists. Tourists also use public transport. Melbourne’s transport policy was developed in isolation with the needs of Motorcycle Riders and other transport users not consulted. The fact that the Council’s policy ignores the needs of Motorcycle riders altogether is an indictment against the Council administration along with the our City Councillors who are ultimately responsible for the management of the City. The longer the City Council continue down this road the more the State Government will distance themselves from the Lord Mayor and Town Hall and Melbourne begin to face the problems associated with having a directly elected Lord Mayor and a City Council that is unaccountable and oblivious to reality and living in fools paradise. The Editorial in Today’s Herald-Sun (Printed in full below) is confirmation that Melbourne Direct Election of Lord Mayor is failing as is the policy of Our City Council and it’s future direction. A Council that is lost in Cuckoo land devoid of integrity and responsibility. A Council that avoids accountability and is full of hypocracy. Standby for the John So – Time to Go. THE Herald Sun today reveals how the Melbourne City Council transport policy is divorced from reality. Readers’ opinions of the city’s public transport are that in its present appalling state it is not an acceptable alternative to the motor car. Yet the latest manifestation of the council’s anti-car policy makes it clear that when it come to transport policies, the Town Hall is in cloud cuckoo land. The MCC’s “experts” suggest lowering the speed limit to 40km/h, forcing cars out of dedicated bus lanes and stripping more road space from motorists in favour of pedestrians and cyclists. The council also suggests blocking new long-term parking spaces and offering residents discounted public transport fares if they give up parking permits. Long-term parkers are already hit by the State Government’s unfair parking impost. But as we report today, the public is angry over the alternative – the city’s expensive, unpunctual, and filthy public transport. As we have noted before, the council, in league with the State Government, is embarking on social engineering under pressure from special interest groups. MELBOURNE’S road and rail transport remains in chaos while the State Government and the Melbourne City Council bow to pressure from special interest groups. At the root of the trouble is increasing disapproval of the motor car as a politically incorrect form of locomotion. The green band offer the following gratuitous advice: catch public transport, ride a bike, or walk to work. But people are entitled to choose whichever suits them without being heavied by governments – state or municipal. In pursuit of its agenda the Government has hit long-term inner-city parkers with a tax of about $40 a month on top of the normal fees. This will double to about $80 a month next year. The latest in the war on motorists is that Melbourne City Council is reportedly urging abandonment of road infrastructure in favour of keeping the city car-free to make way for bicycles and public transport. But more than 90 per cent of respondents to a Herald Sun Voteline said Melbourne’s transport system needs improvement. While the Government spends a fortune on not very fast trains to the bush, Melbourne’s decrepit public transport is not a viable alternative to the car. This city needs a transport vision based on reality, not on ideology.